The San Bushmen, Africa’s oldest hunter-gatherers, lived in the massive Drakensberg range of mountains from 4 000 years ago until they were driven out by colonialists in the 19th century. Over that time, they created a vast body of art on the walls of caves and rock shelters – the largest and most concentrated group of rock paintings in sub-Saharan Africa. This rich collection prompted Unesco to inscribe the Drakensberg as a mixed natural and cultural world heritage site in 2000. The paintings, Unesco said, “represent the spiritual life of the San people” and are “outstanding both in quality and diversity of subject”. 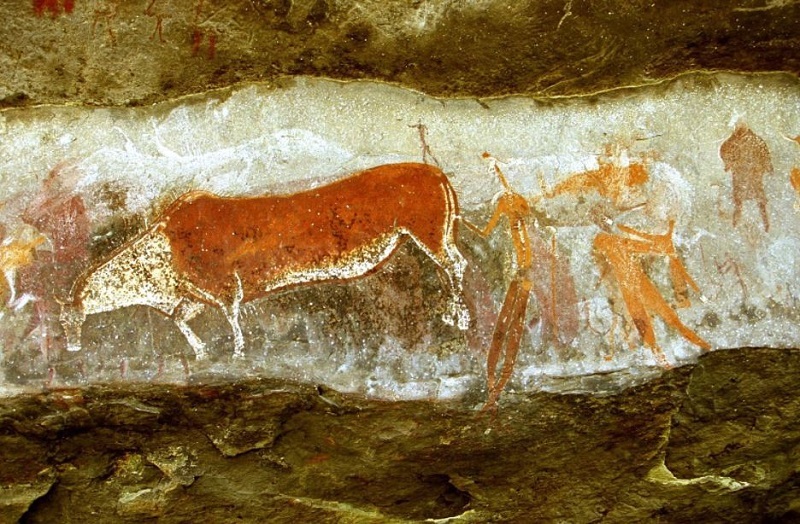 “The San people lived in the mountainous Drakensberg area for more than four millennia, leaving behind them a corpus of outstanding rock art, which throws much light on their way of life and their beliefs,” Unesco said. 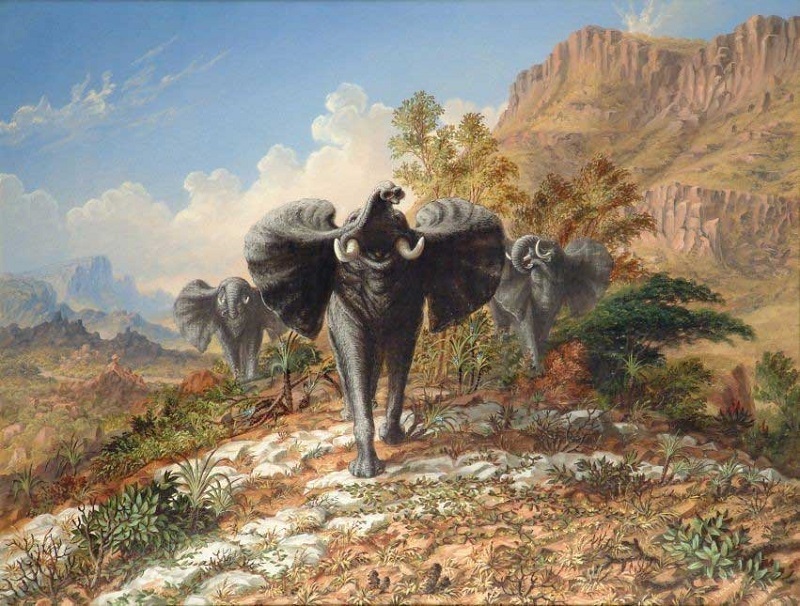 During the early colonial era, white South African artists tended to concentrate on depicting what they saw as a “new world”, in accurate detail. 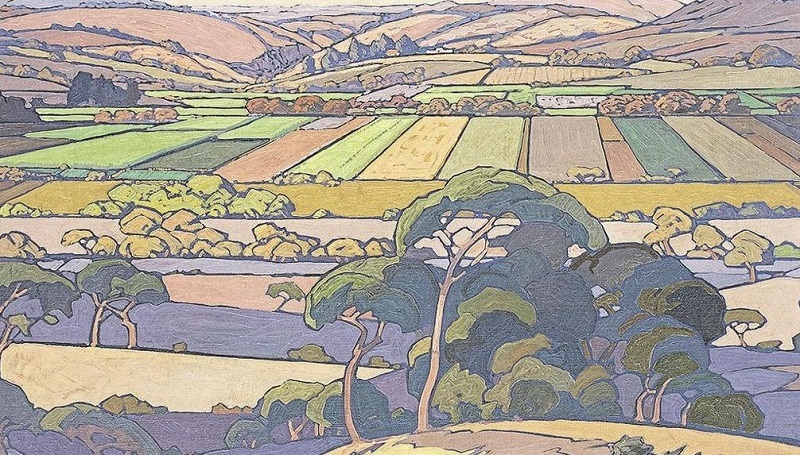 Artists such as Thomas Baines travelled the country recording its flora, fauna, people and landscapes – a form of reporting for those back in the metropolis. 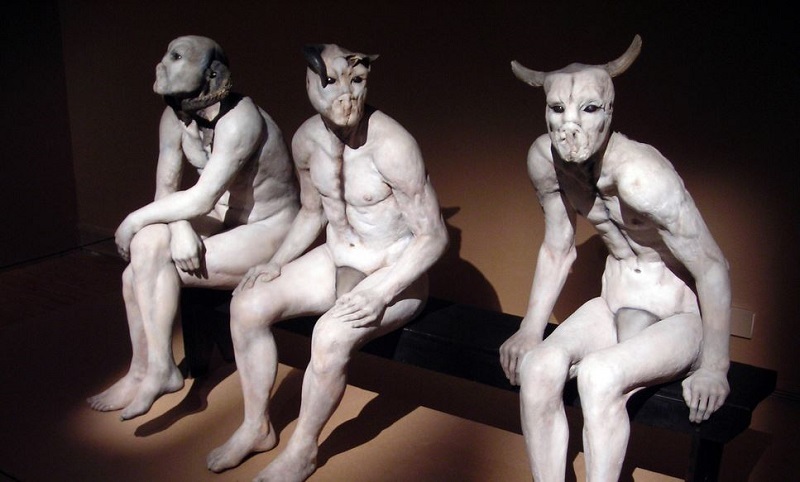 Towards the end of the 19th century, painters Jan Volschenk and Pieter Hugo Naude and the sculptor Anton van Wouw began to establish a locally rooted art. Their work – the first glimpse of an artistic vision that engaged with life as lived in South Africa – marked the moment the country began to acquire its own national identity, with the 1910 Union of South Africa marking the formal end of the colonial era. The apartheid years (1948-1994) witnessed a great diversity in South African art – ranging from landscape painting to abstract art. There was engagement with European and American currents, but also a fiercely local sense of what it meant to be an artist in this country during troubled times. Alexis Preller, for instance, created fantastically detailed canvases influenced by the European surrealists of the 1920s and 1930s. Beginning in the late 1940s, Preller painted African scenes and themes such as The Kraal and Hieratic Women, but these were not realistic portraits of African life: instead, they were reinvented by Preller’s startling visual imagination. Cecil Skotnes, by contrast, took a leaf from Picasso’s book – the European art revolution instigated by the great Spaniard had, in part, been generated by his appreciation of African masks. Skotnes became South Africa’s master of the woodcut, bringing European modernism into fruitful collision with African styles. Meanwhile, a host of white artists were engaging with the South African landscape in interesting ways – though such formalism was increasingly criticised during the struggle against apartheid for its detachment from the political situation. In Sekoto’s works of the early 1940s, such as Street Scene, bustling African figures are placed in the context of their often denuded environment, while Yellow Houses (the first work by a black artist bought by the Johannesburg Art Gallery), reduces the human presence, focusing instead on the environment itself. In Song of the Pick, naturalism gives way to severe stylisation: a rank of workers wield picks in unison, forming a powerful image of African labour; a white overseer’s figure is dwarfed, even threatened, by this phalanx of diggers. George Pemba, by contrast, stayed in the township of Motherwell near Port Elizabeth, living into his 90s and patiently continuing to paint despite the lack of public acclaim. His often naively styled work focused on the simple lives of poor black people, humbly and sometimes humorously evincing their fundamental humanity, though he also treated themes such as the story of the Xhosa prophetess Nongqawuse of the 19th century. 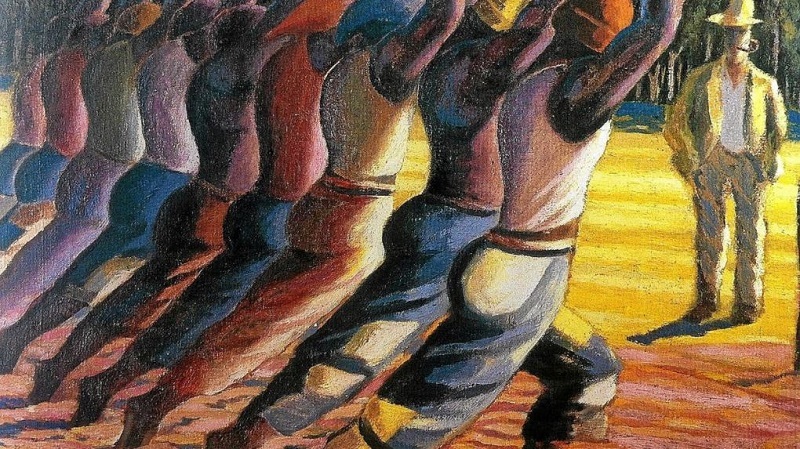 Dumile’s sense of anger and despair fed into work of extraordinary power; his distorted figures seemed to have been physically deformed by the very forces of society. Called “the Goya of the townships”, he painted his own version of Picasso’s Guernica, a cry of pain at human suffering. Dumile went into exile in 1968 and died in New York in 1991. In this he has something in common with another “outsider artist”, Helen Martins, who obsessively peopled her small-town home – known as the Owl House – with sculptures of concrete and found objects, up to her suicide in 1976. 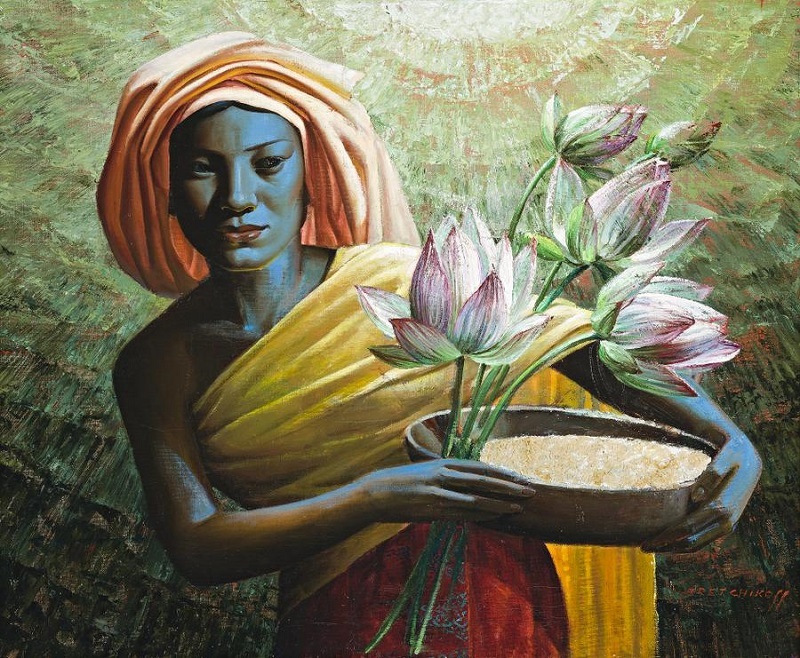 Yet South Africa’s most successful “outsider” artist is perhaps the Russian emigre Vladimir Tretchikoff, who developed a distinctive style in which arch sentimentality was rendered with virtuoso formal exactitude. Tretchikoff had considerable commercial acumen, turning paintings such as The Dying Swan and Chinese Girl (also known informally as The Blue Lady) into prints and selling millions around the world. To the post-modern eye, Tretchikoff’s work, long scoffed at as the peak of kitsch, now has a distinctive ironic charm. From the 1960s on, many South African artists responded to developments in American and British art. The severe yet sensual work of Cecily Sash showed the impact of post-painterly abstraction and later “op art”; the playful surfaces of Helmut Starke and Kevin Atkinson opened the dialogue with pop art. In the early 1980s, for instance, Paul Stopforth made a series of works dealing with police torture – the cause of the death of resistance heroes such as Bantu Steve Biko. And Robert Hodgins satirised figures of power in paintings that turned leaders into sinister but laughable echoes of Alfred Jarry’s mad king Ubu. William Kentridge used expressionist drawings and highly developed personal metaphors, symbols and characters to expose the hypocrisies and ironies of white South African life. More recently, he has employed his powerful drawing technique in “animated” films and installations, and the set design of Mozart’s The Magic Flute. 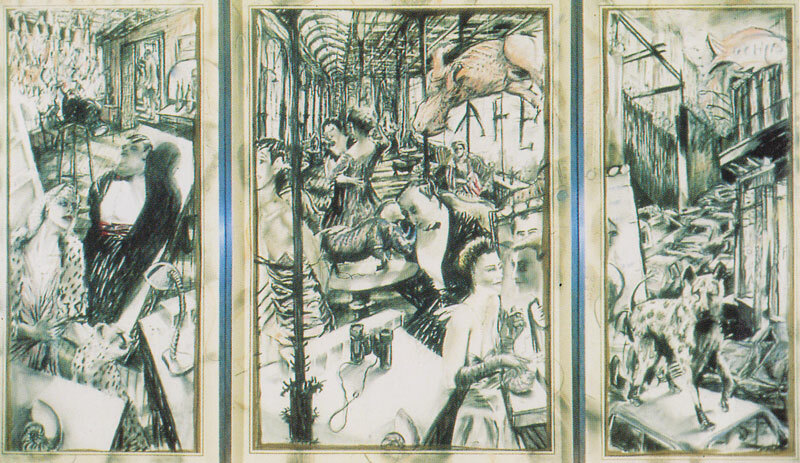 In the 1980s, “resistance art” was increasingly recognised as a genre of expression directed at the white elite’s oppressive exercise of power. For example, trade union posters and T-shirts used imagery that had something in common with the Russian constructivists as well as African art. And anonymous artists placed images of state violence (or bewildering dream reflections) at traffic intersections. 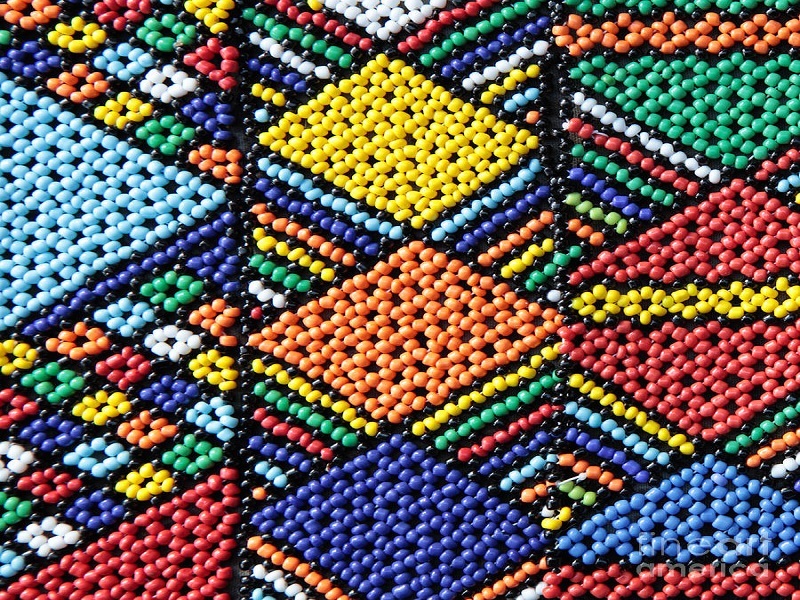 While the “high art” continues to blossom in South Africa, the market for crafts has expanded to include every possible form of traditional artwork. There is a host of work in traditional media on the market. Artists are constantly developing the repertoire of African crafts – from intricate and near life-size beaded wire sculpture to tableware, ornaments and embroidered cloth, to stunning costume jewellery, welded cast-iron objects, folk painting and more. At the same time, the status of the traditionally anonymous maker of craft works is changing: “folk art” has made inroads into “high art”. For example, in the 1990s the work of late ceramicist Bonnie Ntshalintshali went well beyond the confines of traditional African pottery, yet her exquisite creations could conceivably still be used at the dinner table. Notwithstanding the appearance of celebrity “folk artists”, ordinary craft continues to thrive – the main examples being beadwork, pottery, basketry and wooden carving.